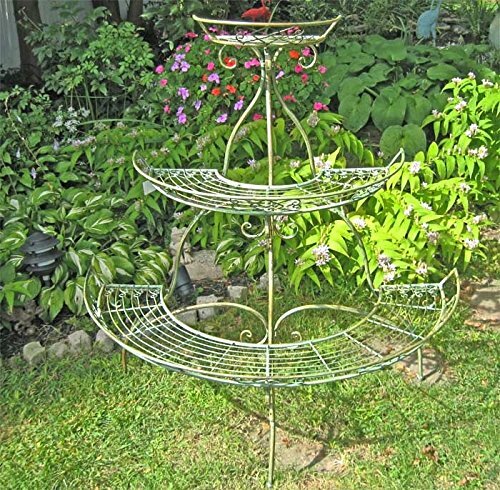 3-Tier Plant Stand - Wrought Iron - Antique Mint Green Finish. The 3-Tier Plant Stand Measures 45" High x 43" Wide at its widest Point x 22 1/4" Deep. Very Nice detail. Assembly Required. This is a new Item. To calculate shipping fees in advance, use Shipping Box 46" x 23" x 6"
Measures 45" High x 43" Wide at its widest Point x 22 1/4" Deep. If you have any questions about this product by 3 TIER PLANT STAND, contact us by completing and submitting the form below. If you are looking for a specif part number, please include it with your message.